Photo by M. Harssch. Some rights reserved. Unfortunately, the implementation proposals that the Commission approved last Thursday are anything but detailed. Rather than setting forth a guide to understanding how the different rulemaking implementation, or effective date, sections should be pieced together to form a “mosaic”, the implementation proposals themselves more resembled a Jackson Pollack painting from the abstract expressionist movement. O’Malia’s immediate goal here is to frame his explanation of why he voted against the proposals: he paints himself as the torch-bearer for concrete, actionable specificity, in contrast to the “broad abstractions” he associates with the Commission majority. “Now is the time for the Commission to give the market concrete direction on how and when to translate the Dodd-Frank rulemakings into an operational reality,” he continues. Thus he uses Gensler’s own metaphor against him, suggesting that “mosaic” really connotes detail and concreteness. The hint of a rift within the leadership of the CFTC is interesting in its own right. More relevant to this post, though, is O’Malia’s apparent disagreement with the poet William Butler Yeats. It is Yeats who gives us what is probably the most famous example of the mosaic as a metaphor, in his celebrated poem “Sailing to Byzantium” (1928). For Yeats, the “holy city of Byzantium” with its “sages standing in God’s holy fire / As in the gold mosaic of a wall” symbolizes the realm of the artistic and spiritual. Byzantine mosaic art is associated with something seemingly very abstract—in contrast to the physical, concrete world of the mortal body. So who is right, O’Malia or Yeats? Does the word “mosaic” connote the concrete and the actual, or the ethereal and the eternal? In fact, the poem itself shows us this is a false choice. To put it as a literary critic would, “Sailing to Byzantium” deconstructs the very antithesis it ostensibly presents. For our purposes, the executive summary will suffice here: There is a tension between what the poem says and how it says it. Byzantium is presented as an abstraction; yet the vivid, concrete language Yeats uses to describe Byzantium and its art (“hammered gold and gold enamelling”) undercuts and thus complicates that suggestion. The outcome here is that the concept of the “mosaic” encompasses both immediate, physical reality and something “higher,” something luminous. Indeed, it fuses these two opposites. And if you think about it, that’s hardly a high-falutin’ conclusion. A mosaic is visual and tangible — it’s one of the few kinds of art you’re generally allowed to touch. It is here and now. But as the poem reminds us, it also bridges past (the form has a rich history going back to Mesopotamia), present, and future, offering us a glimpse of something bigger than ourselves. That’s how we think of the “mosaic” in Knowledge Mosaic. The word is not an abstraction or an empty exercise in branding. Its use is deliberate and specific. 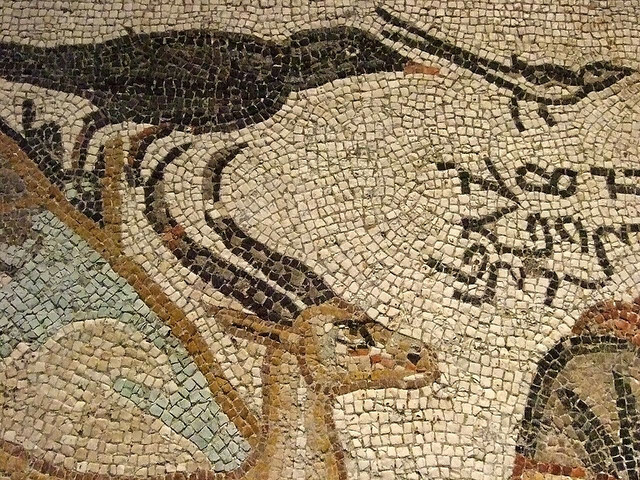 We offer knowledge not as a collection of fragments, but as the tiles of a mosaic — as a unified whole that, like Yeats’s Byzantine mosaic, sings “of what is past, or passing, or to come.” We provide access to the past (data), to the present (news, current awareness), and to the future (guidance, commentary). The concept of the mosaic reminds us that all knowledge is interconnected — and that artistry makes it sing.